Rock'n'Roll Racing. Everybody remembers it. Well, something like the pictures and video. 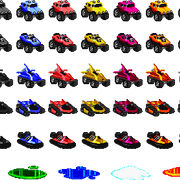 The whole nostalgia of the game could happen in a race locked to colorful Sandkings. Or a bit of modding over the Ruiner. Perhaps some other way of recreating the game... the game was obvious in itself inside GTA. But the circuits were tight, like arenas. Ideas to put in the slow burner. Yea, i just search.. it's micro machines v3!